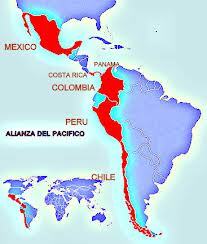 The four countries of the Alianza del Pacífico formally established in June 2011 - México, Colombia, Chile and Perú - together account for 35pc of GDP in América Latina, 50pc of exports from the continent and together their population exceeds 200 million people which gives them a similar magnitude of scale to Brazil (located on the Atlantic side). It also means a new model of regional integration focusing on strengthening institutions to create a regionally integrated trade area, oriented towards the free movement of goods, capital, services and people towards the key markets in ASEAN countries and China. México, by far the largest of the four countries sees an opportunity to diversify its exports from the US to Asia. Currently México sends around 77pc of its exports to the US. But there are considerable opportunities for México's Agricultural-food, footwear and textile sectors to export to Asia. Costa Rica attends the Alianza del Pacífico as an observer, and it is highly possible that it will seek to become a full member in the foreseeable future. Panamá too has expressed interest in joining. In the last 15 years or so in América Latina, several trading blocs have been established from MERCOSUR to ALBA, but the Alianza del Pacífico is different, it is the first to see itself as a truely regional integration project. On his way back from a trip to the Américas, the new Chinese President Xi Jin ping 习近平 will meet US President Barack Obama, in California on 7-8 June 2013. But first President Xi Jin Ping 习近平will spend a week from 31 May to 6 June visiting México and Costa Rica. It is no coincidence that the Alianza del Pacífico decision to seek further regional integration was formally agreed ahead of Xi Jin Ping's 习近平visit. This visit will provide México's President with the possibility to begin to re-balance the trade relationship with China. Interestingly Xi Jin Ping 习近平will also visit Costa Rica (another potential member of the Alianza del Pacífico) as well as Trinidad and Tobago. The visit to Trinidad and Tobago is significant as it will be the first visit of a President of China to the English-speaking Caribbean. Costa Rica is China 's second largest trading partner in Central America while China is the second largest trading partner of Costa Rica. In recent years, bilateral trade between the two countries has grown rapidly. In June 2007, China and Costa Rica established diplomatic relations. In November 2008, Chinese President Hu Jintao visited Costa Rica and announced the launch of China-Costa Rica free trade negotiations. The China-Costa Rica free trade agreement (FTA) came into force on 1 August 2011. Finally, when Xi Jin Ping 习近平 meets the US President, the meeting will not take place in Washington or on the Atlantic coast, instead the symbolism of the meeting taking place in California could not be clearer, it highlights the increasing importance of the Pacific over the Atlantic. The Nicaraguan government has recently stated publicly that it would like to construct a new canal with links between the Atlantic (Caribbean coast) and the Pacific Ocean. It has already started working with a Chinese company on a canal construction project. The idea is that the Nicaraguan canal would not be in competition with the Panamá canal, which is currently undergoing full expansion, instead, the Nicaraguan project would be focussed on receiving vessels up to 250,000 metric tons, the locks would be 460 meters big with a capacity to take boats with a depth greater than 20 meters. 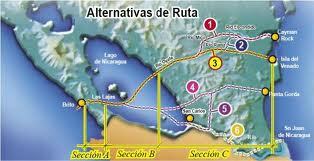 The exact route of the Nicaragua canal is still to be determined but some experts believe that the project could be developed using the recommended routes of a multidisciplinary study presented in 2006 by the then President Enrique Bolaños. This study recommended the canal be built on the Caribbean coast of Nicaragua, near Bluefields Bay City, and then go along rivers within Nicaraguan territory and then through the Great Lake of Nicaragua, over a distance of 280km. This is a mammoth project that will require considerable investment not only to build the Canal, but also in construction of port infrastructure, railway infrastructure and potentially airport runways too. The Nicaraguan government sees the canal as a pipeline for oil crossing from the Caribbean Sea to the Pacific across to the markets in Asia but it will be used for all trade.The Geo-Trade Blog will continue to follow closely developments on the new canal. Most interestingly, this mega project adds more evidence that world focus is increasingly moving away from the Atlantic and the focus in the 21st Century is on building the infrastructure and diplomatic ties with the Pacific.